1. Preheat oven to 350 degrees F. Place 5 silicone cupcake liners on a sheet pan and set aside. 2. In a bowl, whisk together all of the cupcake ingredients until mixture is smooth and well combined. Evenly spoon cupcake batter in all 5 cupcake liners and bake in the oven for 16-20 minutes, or until toothpick is inserted in cupcake and comes out clean. 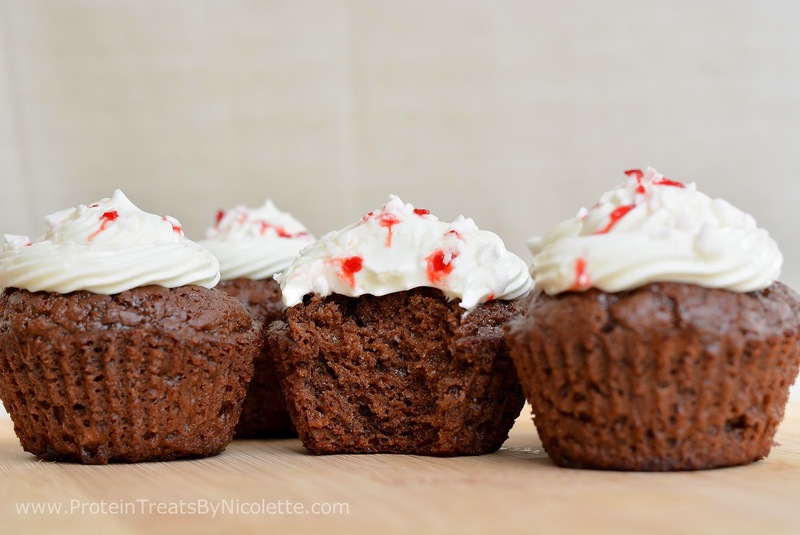 Let cupcakes cool while the icing is made. 3. For the icing, heat up the cream cheese in the microwave for 10 seconds. Whisk until smooth then add in the remainder of icing ingredients and stir together. 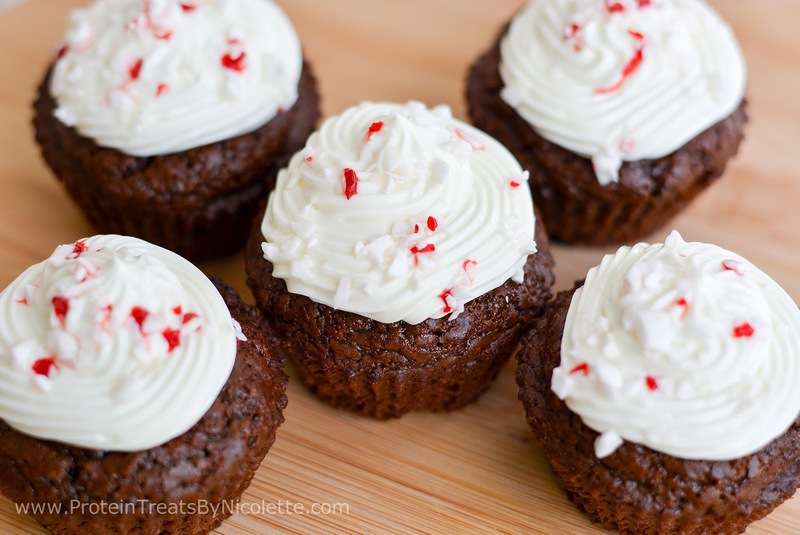 Evenly spoon icing on top of each cupcake and add crushed peppermint, if desired. Serve immediately. Store leftovers in the fridge for up to 5 days. 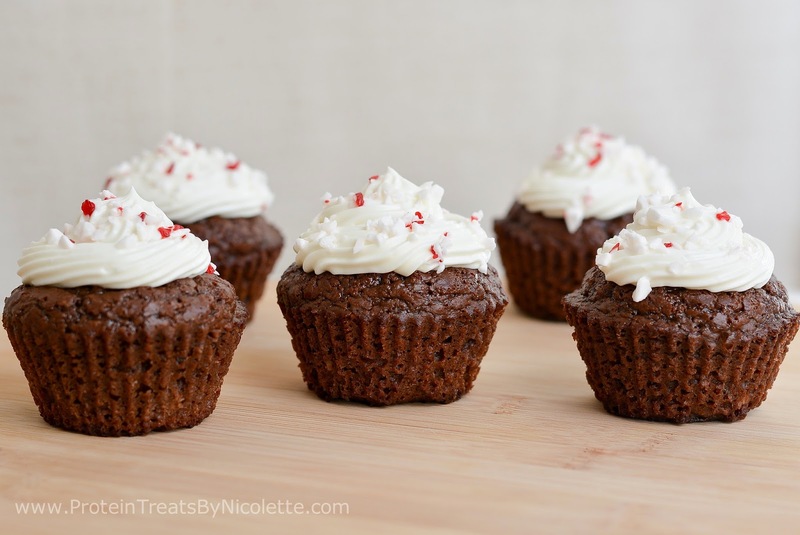 * If you don’t have silicone cupcake liners, you can use regular liners but make sure to spray them with non-stick spray and place them in a cupcake tin for baking. * For an added hot cocoa flavor, use your favorite hot chocolate powder mix instead of protein powder. Note the macros will change. I made these this afternoon and found them to have way too much stevia. I couldn't eat them :( I think next time I will add just a tablespoon or two.